Preparation: Bring a photo of a bird or a stuffed animal to represent the animal sacrifice. You may also use some play money or coins for the buying and selling. This morning’s Gospel reading is taken from the Gospel of John, the second chapter, verses 13 – 22. It is the one place in the Bible that shows Jesus being so angry, that he turned tables upside down and chased people away with a whip. It’s not the usual picture that we have of the peaceful, loving Jesus. In verse 15, it says, “Making a whip of cords, he drove all of them out of the temple, both the sheep and the cattle. 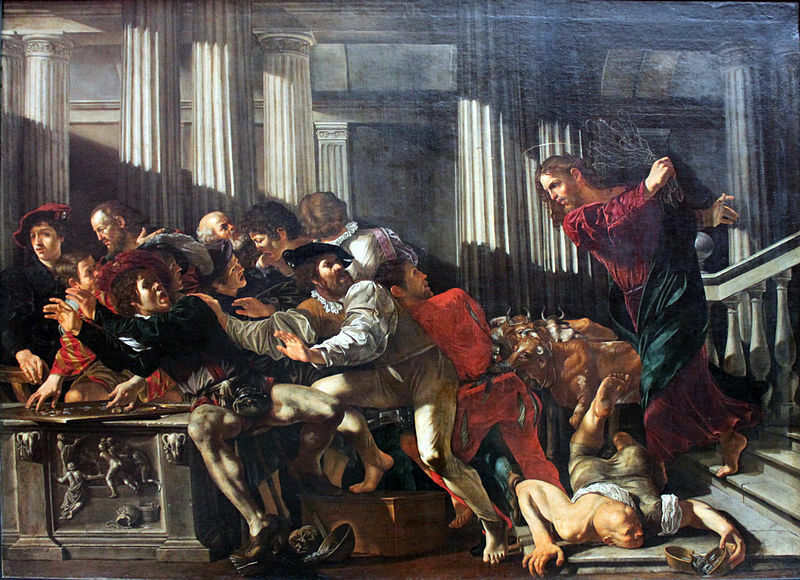 He also poured out the coins of the money changers and overturned their tables.” Why did he get so angry? Why did Jesus chase everyone out of the temple? The temple, or the place where people came to worship God, should have been the one place where everyone knew they would be loved and accepted and treated fairly. Our churches should be the same way, shouldn’t they? But when Jesus visited the temple in Jerusalem, he found that a lot of cheating was going on. Here’s an example. (Choose some volunteers to be the sellers and buyers of doves.) Let’s say that these two travelers (choose two children) come to Jerusalem to worship at the temple. They are poor, so they have only a pair of doves to sacrifice to God. They have brought this sacrifice out of love and want to enter the temple. They are stopped, however, before they can come in. The priest (you can take on the role of the priest) stops the travelers and says, “You can’t offer these doves as an offering! They are not perfect enough. I will buy these doves from you for a small price. Then you can come in and find a couple of perfect and blessed doves to offer as a sacrifice. So the travelers sell their doves and go further into the temple where they have to buy a couple of doves at a much higher price that they can barely afford. They buy the doves and make the sacrifice. They will have to go without food for several days, but they are happy that they can worship God in this way. Jesus knew what was going on here. The doves that they were forced to buy were just the same as the ones they came with. The travelers were being cheated by the priests in charge of the temple. Jesus was very angry that people were being cheated in his Father’s house, right in the temple. In much the same way that you feel angry when someone you love is hurt by others, Jesus felt angry that the poor people, whom he loved very much, were being cheated and taken advantage of in God’s own house. Love is gentle and kind, but love is also angry at things that are unjust and not right. As Christians, we are also called to protect the poor and the needy. May God give us the strength and courage to show love and to show justice in the world. Prayer: Dear Father in heaven, help us to love others and do justice in this world. Give us courage and strength. In Jesus’ name, Amen.